There are great day trips in County Clare that won’t require much effort except for some stops at some great attractions and destinations along the way. One of the best ways to see Clare is on a day trip. So, the route we will embark on here is to go up through the Burren towards Ballyvaughan and then to head south again by the Burren and along the coastline. First we will be stopping at the Burren Centre in Kilfenora, Co. Clare. This is a great quick visit museum and gives lot of information on the history of the Burren, great information on the rock formations and is a a hive of information for what lays ahead! After this visitor centre a stones throw away it is worth going around the coroner to the ‘Doorty’ cross a 12th century cross with Nordic influences. In the graveyard there are many stone crosses but this one is worth taking a look at for the detail and overall character of the celtic knot work and animal detailing. A great photo opportunity! After this we back track a bit back down for three miles and take a left and get on the road R480 to start the drive up through the burren. This road is not good but feels very authentic and wild for the visitor, on this road the landscape starts to change from vivid green to the lunar landscape of the Burren. After a few miles there is a sign for the Poulnabrone dolmen on the right. There is a free visitors car park. This experience may feel touristy if there are lots of visitors but it is special none the less. This megalithic burial tomb is over 2 meters high and is one of the best examples of this type of tomb structurally. Most of the 163 tombs in Ireland are in the northern part of the country so this is quite special. The megalithic period spanned from 4000 BC – 3000 BC and Newgrange came later so this is an older structure. People would have lived here once and there is some nice outdoor signage explaining this. One other great thing to see here are the beautiful flowers of the Buren. Some species are specific to this area but be kind they are protected and taking flowers for home presses is not allowed! Time: 20 mins! Next on the burren trail is to head north, still on the R480 to the Aillwee Caves. This fantastic underground system of caves deserves two hours and a fleece top (even in summer) it is moderately colder down there. The centre also has an education centre and a hawk walk featuring shows with birds of prey in the summer months. The coolest thing about the caves are the colour of the rocks and they allow you to take a fossil on your way home! Next on the road we head for Ballyvaughan. Before we get there we take small detour to the Burren College of Art. When you are driving down the landscape it really is beautiful, black head is growing bigger and this turret appears in the landscape. There is a long road down to it and it looks private but don’t worry! It is open to visitors but many people pass it by. Newtown castle is a 16th century tower house. This landmark was restored in the 1994 and is open to the public year round. What makes this space so interesting is that it is used by locals for music sessions and artists for installations and exhibits so who knows who you might meet or what you might see in the tiny spaces on each floor. The winding stair case is also a treat to walk up and down and it really harks back to olden times. There are great views of the burren from the top of the tower and many opportunities for amazing photos inside and out. The art college is only feet away and worth having a walk through the front courtyard. Artists studious are facing the courtyard and it is a very zen like open space with the trees and black head you feel nestled in a place that truly mixes the old with the new exposed on one side and sheltered by blackhead on the other. Next up the road is probably one of the most charming spots on the coast of Clare. Ballyvaughan has retained its charm and thankfully missing the commercial element of so many other tourist towns in Ireland. Ballyvaughan was once a fishing village and remnants of that old life can still be seen on the pier. On a summer evening lots of locals can be seen jumping in for a quick swim. If the temperature is above 18 and from June onwards it is recommended to bring your bathing suit! It is beautiful to go for a short walk along the water against the backdrop of the rolling burren hilly rock formations and on the other side of the water traditional Irish cottages sit on a slight hill. It is truly picturesque and sort of twee but always relaxing and calming. Before we head off on the next leg of the Burren journey we have to eat! Ballyvaughan boasts two great eateries overlooking the water and perfect for a bite. Monks has great seafood and there is outdoor seating. Inside the walls are covered with maritime knicknacks and historical prints. There is a perfect mix of both locals and visitors to make this a friendly spot. If you are looking for lighter food and a quieter atmosphere the tea room just down the road makes for a perfect alternative. The front garden of this cottage is a show stopper. In spring and summer time the flowers are in full bloom and most people are blown away by the variety and colour combinations. It is worth a cup of coffee just to see the garden in detail and enter through the genuinely old and cared for red gate! After lovely food and sitting by the water, it is time to move! The coast road can be taken so that we are driving parallel to the water and Blackhead is on the left. It is a little windy and narrow but the scenery on either side is magnificent. Galway with its Twelve Bens in Connemara can be seen on the other side of the water. After about five miles this road opens out to a usable part of the Burrren. 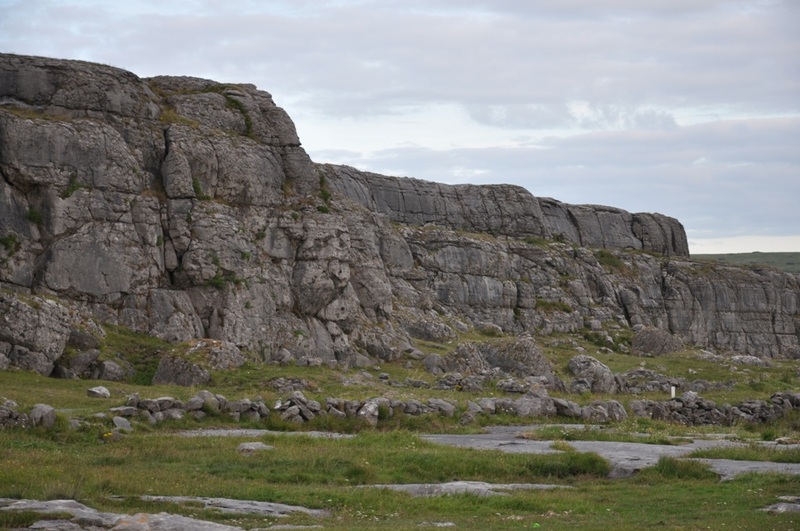 The moonscape rock formations of the Burren can be experienced on either side. This area is popular with rock climbers and walkers. There are parking areas along this road and this is usually where an hour or so can be spent waking and enjoying the shapes of the rocks, the textures and unusual if sparse flowers. After this the last stop on a lovely summers evening is the Beach at Fanore if the tide is in there is still lovely dune waking and space in the high tide for a dip, but be warned there are unassuming rocks underneath so watch out! If the tide is out this beach is perfect for a long walk and a rest at the end the day with an amazing sunset. There are so many camping grounds and guest houses near by or if one heads further down the road to Doolin but only before 9pm it is harder to find someone manning a guest house or camping grounds after this time!